For years, scientists have understood that Greenland's ice sheet contributes to rising sea levels through the combination of surface melting and accelerating outlet glaciers. What’s less understood is the behavior of different glaciers in different locations. One scientist, Ginny Catania, Research Scientist and Associate Professor at the University of Texas in Austin, is studying how and why some glaciers behave differently than others. Those three glaciers are Rink Isbrae (RI), Umiamako (U) and Kangerdlugssup Sermerssua (KS). Catania’s research kicked off last year when three teams visited Greenland over three separate months (July, August, and September 2013) to collect oceanographic, atmospheric, and glaciological information about the neighboring glaciers, which terminate in fjords north of Uummannaq, off Greenland’s west coast. Each team surveyed different sections of the glaciers’ systems in a collaborative, multi-institutional effort to understand how fast glaciers advance and recede. In the upcoming field season, two teams will return to recover data and service and redeploy instruments. “Our approach is interdisciplinary between glaciologists and oceanographers, with each PI bringing unique skills to the project,” Catania says of the collaboration. The first team included Dan Duncan and Marcy Davis (University of Texas) and George Roth (University of Oregon). They arrived in Greenland in mid-July with the task of making geophysical and oceanographic measurents in the fjords. Very little bathymetric (i.e., seafloor) data exists in most of Greenland’s fjords, and West Greenland charts are dated and often sparse with information. Some waters remain completely uncharted. Detailed surveys have been done in active harbors in populated areas and in some areas where mining or oil exploration requires some knowledge of the seafloor topography. To map the seafloor, the team used a multibeam sonar system, which sends out pulses of sound. When the sound reaches the seafloor, it bounces back and is recorded by the instrument, which creates an image of the seafloor topography. The team sailed aboard the Minna Martek (owned and operated by Martek ApS), a vintage (1962), 22m-long, Norwegian-built cargo vessel, now based in Nuuk. From IIlulissat, they sailed north to Nugaatsiaq, a hamlet on the southeast end of Qeqertarssuaq Island, where they set up a temporary GPS base station and a pressure sensor to record tidal and temperature variations during the survey. Next, the team spent three sunshine-filled days working in KS fjord followed by three overcast days in the ice-choked RI, Karrat, and Umiamako fjords. The multibeam, a large horseshoe-shaped instrument, was mounted on a pole and bracket over the side of the ship adjacent to the “control room,” a snug port-side space that housed the brains and gumption behind the system. Following a successful survey, the team returned to Ilulissat sans Duncan, who disembarked in Uummannaq to join team two: Leigh Stearns and Steve Foga (University of Kansas), Lauren Andrews (University of Texas), and Tim Bartholomaus (University of Texas). In a few days of helicopter runs, team two deployed 10 high-resolution GPS receivers on the three glaciers. The GPS stations track glacier movement and are outfitted with solar panels and batteries to keep data logging year around. Seismometers and tide station will track calving events at the glacier face. Cameras aimed at the glacier termini will take still shots every half hour to monitor calving throughout the year. In September, team three (Jonathan Nash and Emily Shroyer, engineer Jed Smith, Saskia Madlener (Oregon State University), John Mickett (APL-UW Seattle), Laura deSteur (Netherlands), David Sutherland, Dustin Carroll (University of Oregon) arrived in Uummannaq to complete an oceanographic survey aboard the Greenland Institute of Natural Resources’ 61-m ship, the R/V Sanna. Team three deployed seven subsurface moorings, long strings of instruments weighted to the seafloor by train wheels. They outfitted moorings with temperature sensors and instruments designed to measure water flow velocity and other water properties such as salinity and turbulence. Moorings were placed at locations throughout the fjords between the glacier face and the open ocean. Their unique design allows the upper 150 meters to break away should a passing iceberg entangle or damage the mooring. 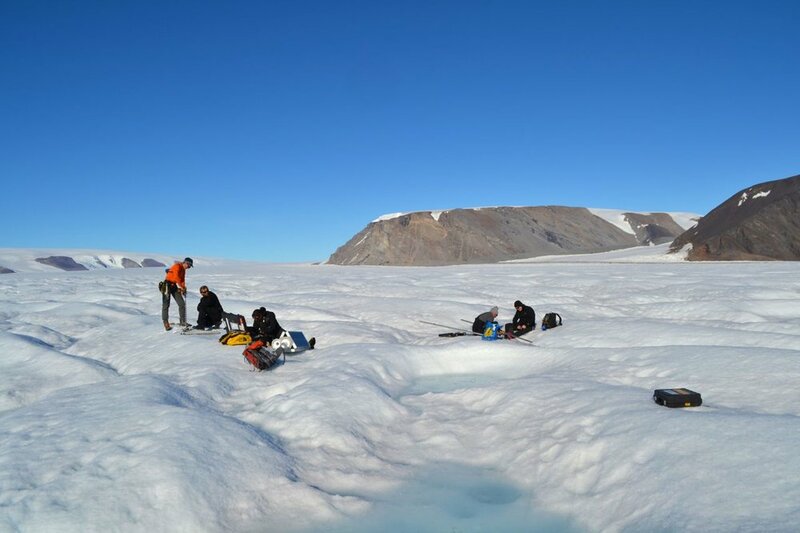 "Fieldwork in Greenland's outlet glacier fjords is difficult, to say the least. Icebergs with drafts over 1000 feet, inaccessibility, [and] strong katabatic winds all combine to make it a hard place to get data--thus, subsurface moorings are our best friends,” Sutherland explains. “They sit happily underwater (in sometimes subzero degree waters!) and gather data year-round on water properties and velocity, allowing us to give temporal context to our limited summertime shipboard data. It's important to get the year-round time variability as it will let us piece together a picture of the fjord circulation in both areas and, more critically, allow us to examine differences in the two fjords that might be controlling the glacier speeds at their heads." In combination with two years of field observations, the scientists will also analyze remote and visible satellite imagery. Ryan Walker (University of Maryland/NASA) will incorporate these data along with results of in situ data into ice-ocean computer models.